Grounding Goddesses Fall 2017 Retreat. Front row: Smidge Isgrid. 2nd row left to right: Michelle Johnson, Kelli Nixon, Tiffany Wade, Jessi Cook, 3rd row: Natalie Humble, Nikki Williams, Beth Jones. 4th row: Sherry Sternad, May Harshberger, Candace Bradway, Connie Hansen, Tiffany Earle, Melissa Morgan, Kyla Germany, Cheyenne Wade, Brandy Germany, Kristin Record. I don’t think I’m really back yet. Or if I am…I am so completely changed that part of me must have been left behind. Maura, Sarah, and Ali pitch their tents unaware that trans women aren’t welcome there. All of us in Goddess class had watched the episode where Maura and her girls go on a women’s retreat that takes place at the 42nd Idyllwild Wimmin’s Music Festival. We planted the seed thought and within 2 years we had a campground willing to let us host our women’s retreat. I am a firm believer in thoughts determining reality…but the way this all fell together felt truly guided and blessed by forces greater than us. We’ve been studying the sacred feminine and learning how to heal the feminine wound within ourselves for the past two years. We really wanted to reach new levels of involvement and reach new women as well. I am fortunate enough to work in a large spiritual community located in Tulsa, OK. and I also belong to the Tulsa Chapter of the Theosophical Society. The church I belong to and work for, the Church of Holistic Science , owns and operates a metaphysical bookstore, Peace of Mind Books, that hosts classes and workshops. As the event and educational coordinator, this has given me broad access to a number of teachers and healers in the Tulsa Area. And being a member of TS gave me access to their camp in the Ozarks. I reached out to the teachers I thought would add the right energy and what happened was nothing short of magic. Truly a rare occasion where everything just gelled. On top of that our timing could not have been more perfect. The weekend of Sept 22, 23 and 24 not only the first day of Fall, but it was also the new moon, the equinox or Mabon, and the start of Navratri the Hindu celebration of the goddess in her many forms. So we tapped into these feminine energies and spent the weekend working on our physical, emotional and spiritual bodies. 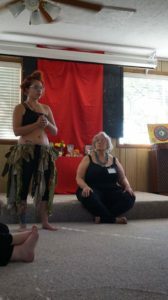 Smidge Isgrid conducting the Sacred Shimmies Workshop at the Grounding Goddess Retreat. By Saturday night’s bonfire, we were loose, happy and free. The work we put in and the love we had for each other was evident from our smiling faces. We had shed layers and layers of stress, expectations, and negativity. Sunday’s final ceremony was one of the loveliest I have ever been a part of. I felt the Goddess in our midst. She blessed us and showed us what we could truly be. We came down off that mountain lighter, radiant, and inspired. The next Goddess Retreat will be the first weekend in May. Our theme will be centered on the Heart Chakra and celebrating Beltane. If you are interested in attending class or the next retreat, please feel free to call or email Michelle Johnson at michelle@churchofholisticscience.org or call her at 918-583-1090.